Hello June! My, didn't you sneak up on me! May didn't feel like it zoomed by, so I'm not quite sure why I'm so surprised that June has arrived. Oh well. Not too much about May has stood out for me, my knitting kind of felt like it was all over the place. I had frantically finished the knits I was donating to my kiddo's school, plugged away on my both of my socks, and Stash Dash had begun a mere week and a bit ago (which i hope will give me some kind of direction with my knitting). And now, with June here, I've realized I've got less than 4 weeks to churn out 2 more teacher appreciation gifts. I know, I know...a lot of people have mentioned how generous I am being by hand knitting my gifts for my son's 2 teachers and EA. But really, if I had it my way and was rich enough to do so, I would give them all fabulous vacations instead of hand knits. These teachers all deserve it!! I have no idea what I would do without the amazing help of the Munchkin's EA. She has been absolutely incredible when it comes his rough days and stubborn ways. As much as I love my plain vanilla sock recipe when it comes to knitting up the self-striping yarns that I love so much, I think it's time I switched things up a bit. This blog and my sock knitting life can't be all plain vanilla. Can it? Well, the thing is, I don't want to stop knitting with self-striping yarns! I guess I could go crazy and try knitting a pair of entrelac socks but I just don't know if I would ever wear them. I'm a striping purest and don't like the idea of mixing stripes with cables or lace as I think one design element takes away from the other, especially when working with such a small item like a sock. So I set out on a quest to find a sock pattern that was somewhat similar to a plain vanilla sock but had a little something-something going on to give some sort of interest, whether it be within the execution of knitting the sock or showcasing the awesomeness of the self-striping yarn. Luckily I didn't have to search long or even hard. I had seen some pretty funky looking socks on a Instagram, a few Ravelry forums, and then caught wind of it (sadly at the tail end) on the Knitabulls podcast when they held a KAL for these socks. If you didn't catch my dead give away on the header at the beginning of this list, then here you go, the Mystik Spiral Socks by Josh Ryks (his Rav name is swordofaknitter, in case you needed to know). I love how the design takes advantage of self-striping yarns and how a great self-striping yarn could really highlight the design. I'm pretty excited about these socks and can't wait to cast on for them once I finish up with my Unikitty socks. That is, if I can decide on which skein of self-striping yarn to use! Now you're probably wondering why in the world am I talking about deodorant on a knitting blog. Well, you see, you would think that after 5 years of living in Victoria that I would learn that this is a city where you really need to dress in layers. Especially in my area of the city. I know that Victoria has quite a few eco-systems and yet I'm still finding myself surprised that I could be walking down the street feeling blistering hot and 2 blocks later all of a sudden be chilled to the bone. Being so close to the water, I also tend to forget about the chilly breezes that can nip away at you (although, are also quite wonderful during the summer months!). Most of the time I find myself either sweating uncomfortably or annoyed and wishing I had bought along a sweater, a scarf, or down duvet - anything warm and to stop my teeth from chattering! And now that I'm getting *ahem* older, I find my body temperature is all whack. So I tend to overdress, just in case. And yeah, it's also not wanting to put away my lovely hand knits just yet. So this is where the deodorant comes in. I used to always be paranoid that I smelled. Mainly because I never wore deodorant. I'm not a smelly person, at least, I don't think so. But I like to make sure that I don't. The regular stick stuff that you get in the drugstore irritates my skin and no matter how little I put on or how "invisible" it's suppose to be, there's always some white mess in the arm pit area of my tops. Those crystal deodorants either don't work for me or don't last long enough, and a lot of natural deodorants were either too messy or just didn't smell appealing to me. Enter: Pit Pure. My friend Kristine had concocted this fantastic creation years ago when she couldn't find a natural deodorant that worked for her, and it's only within the last 5 months that she decided to go into business. When I put out the call for donations for my kiddo's school's fundraiser, Kristine was one of the first few to immediately offer a donation. Long story short, I got myself a tin of her Tranquil (lavender scented, my favourite!!) and she threw in a tin of Bliss (chocolate orange...SO yummy!!) for me to try out. It was weird at first as I've never had to rub deodorant into my pits before, but after the first 2 days I quickly got over it. I liked that you really didn't need much of the product and was surprised as to how creamy smooth this stuff was. After a week, I realized not once was my skin itchy and irritated, I didn't stink, I didn't get headaches from any overly powerful fragrance (it's scented with essential oils), my pits were oddly smooth and touchable, and never did I have those weird white lines of caked on product. I also realized that all the shirts that I had worn that first week (a lot of them black) didn't have any white smear marks! The second week I had a little bit of white in the underarms (I knew I had put on too much product though) but nothing that a quick swipe of a lint brush couldn't take away! Which is great news for all my hand knit sweaters! Needless to say, I am hooked! A little truly goes a long way with this stuff and so I think 1 tin will probably last me more than 6 months. But the best part is that not only am I supporting a friend, a fellow mom, and a small entrepreneur, but I'm supporting a hometown local AND I'm using a product that's non-toxic, plant based, vegan, isn't tested on animals, and uses all-natural ingredients that I can pronounce and actually know a little about. 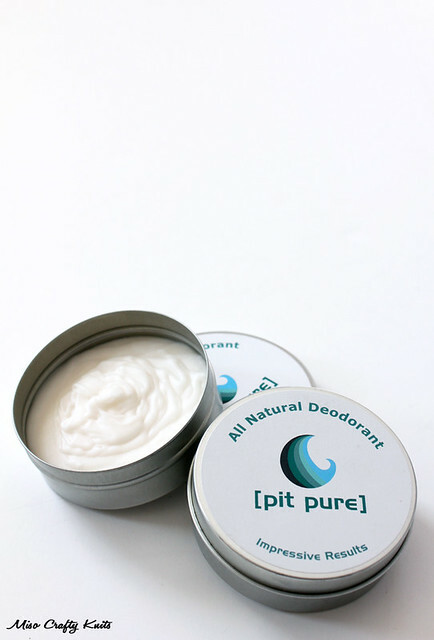 If you've been on a hunt for a deodorant like this, I say definitely give Pit Pure a try, I HIGHLY recommend it! This stuff works and Kristine is super friendly! I've been brewing my own kombucha for the past 6-7 months now and had always stuck with drinking it plain. 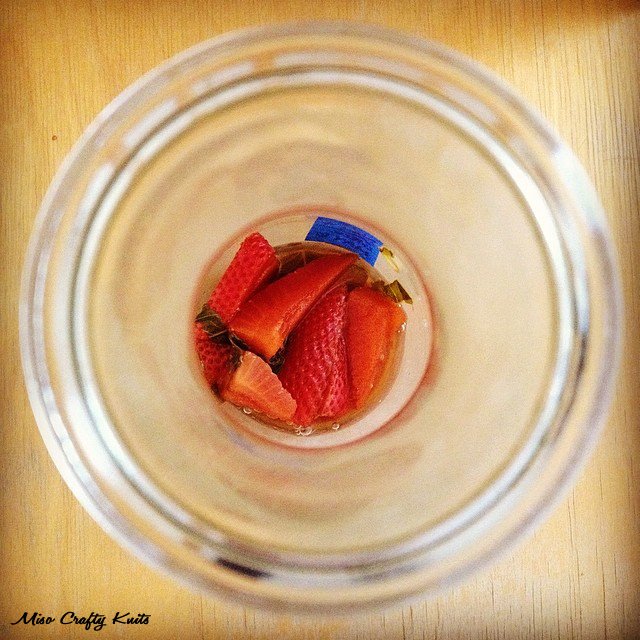 Earlier in May I decided to give my taste buds a jolt by flavouring one of my batches with strawberries and fresh basil. Um, can I just say best.drink.EVER!! Holy smokes. It was SO delicious that the 2 litres that I had brewed barely lasted 3 days. I don't even know if the body can handle that much kombucha in such a short time! I've got my balcony pallet garden all stocked up with basil and I'm (im)patiently waiting for my local strawberry season to begin. I seriously cannot wait to brew a ton more!! I wish I had a bottle of it now! But first, I've got to get my hands on another SCOBY. The last 3 jars I had brewing were sadly ruined. One jar was attacked by fruit flies (stupid elastic had snapped to a thread in the back of the jar, allowing enough room for the damn pests to crawl in), and the other 2 jars (which were sharing the same brew) had mold growing along the surface (I had a feeling my ratios were off, I was in total denial though). I've now learned my lesson and should have had a SCOBY hotel going, rather than composting them every few batches. And now, because of my lack of a SCOBY hotel, I MUST find myself a SCOBY before strawberry season begins! 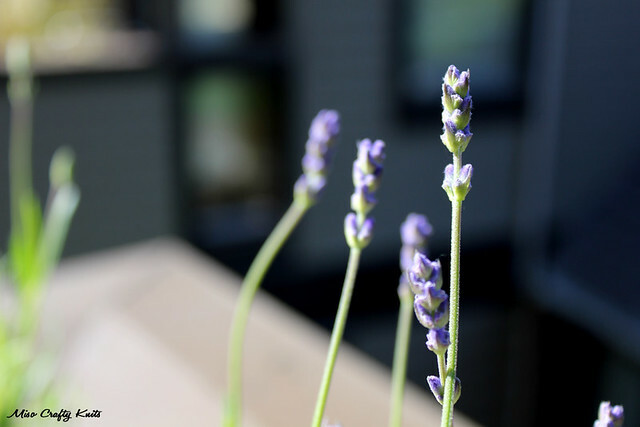 I have to admit, this obsession has actually been going on for a few months now and has only been exacerbated by the fact that the Mister had brought home 2 lavender plants for me to add to our balcony pallet garden. I've been itching to have a lavender garden (I'm contemplating getting a few more plants) and I've been dying to get my hands on some dried cooking/baking grade lavender (there are 2 local farms in which to get this but they are too far for me). I've been daydreaming of making lavender simple syrup for my tea and baking lavender into blueberry muffins and lemon loaves. I'm getting all antsy! I need to read up some more about how to tell when lavender is ready to harvest, how to prep it for the off season, and so on. For now, I'll just keep (quietly) singing to my lavender plants in hopes that they'll grow faster and in abundance! I LOVE Magic Loop. I'm a Magic Looper, through and through. If I can Magic Loop it, I will. But with that said, lately I've been thinking of maybe trying my hand at using DPNs again. I know, crazy! And definitely makes anyone who is a fan of Magic Loop scratch their head and go, "whaa...? Why??". Well, as we all know, Magic Loop can be hard on circular needles. It can cause weird kinks if the cable is too stiff, and it wrecks havoc with the joins - making the lifespan of the needles even shorter by all the stress the join has to endure. If you Magic Loop socks with a short cable, the life of your needles is cut even shorter since the weight of the knit mixed with the cable being force to bend even more harshly can cause the join to snap even quicker. Knock on wood, but I have yet to experience a cable snapping off my needles, but I can tell you, I do have a few circs that look like they're on the verge. So lately I've been wondering what it would be like to knit with DPNs again? I haven't knit with DPNs in almost 5 years. Well, properly, that is. I've used a DPN to help start my hexipuffs, and sometimes use them to fix cables or as a cable needle. But I haven't knit anything in the round with DPNs. I still own a good range of sizes in DPNs, but they are all made of either bamboo or wood and I know I'm far too tight of a knitter to be able to knit with them comfortably and without thinking with every stitch that I'm going to snap a needle in half. I've been thinking about DPNs so much lately that I think a visit to my LYS in search of a set is in order! But what kind? I promised myself I wouldn't go nuts, I just need 1 set to try out on a pair of socks. This is a rabbit hole I definitely don't want to venture too deeply into! Well, that's May. June is looking to be a busy month, hopefully it will involve even more of these 5 things! Especially the lavender and strawberry-basil kombucha! Welcome back to DPN's, I LOVE them!! I really love my square ones. Haha Arika! :P I'm NOT a convert....just wanted to try them out again! Just to see. I'm a DPNer too. I just find I have such a good rhythm with them and I didn't think Magic Loop saved me any time. I also love ALL THE LAVENDER THINGS!! I had a magnificent Lavender Mojito once in Whistler. I bought food grade lavender at a lavender farm in Oregon on a road trip and I'm ashamed to say I haven't touched the packet since I bought it. I wanted to use it to make lavender shortbread (a co-worker had made me some once) but I just haven't gotten around to it.